I-469 Pavement Improvement Study with Mobile Lidar - Continental Mapping Consultants, Inc. This section of interstate was slotted for pavement improvement because of numerous transverse cracks, pot-holing, and pavement failures. High water tables and inadequate sub-grade drainage led to loss of structural strength in the sub-base. The corridor is critical as it sees a lot of bypass traffic around Fort Worth and serves as a major commerce connection to many industrial cities in the Midwest. General Motors has a large manufacturing plant that builds popular pick-up trucks just 12 miles west of the project area. This project had to be fast and right the first time. The client had design deadlines yet the project didn’t get funded and contracted until mid-December. In many parts of the country this wouldn't have been a major obstacle, but this project area was east of Lake Michigan where lake effect snow and precipitation are a near daily occurrence this time of year. The surveying team needed to expedite data collection so designers could be effective throughout the winter months. Setting up base stations where there is a solid GPS lock is a key to success. The designers required a high accuracy 3D model of the road surface, shoulders and ditches as well as bridge clearances. To complete the project, Continental Mapping used a Riegl VMX-250 mobile lidar to acquire high accuracy mobile lidar data along the interstate and cross roads. In addition to mobile lidar, Continental Mapping calibrated public domain aerial lidar data to the project control and fused it with the mobile lidar data. 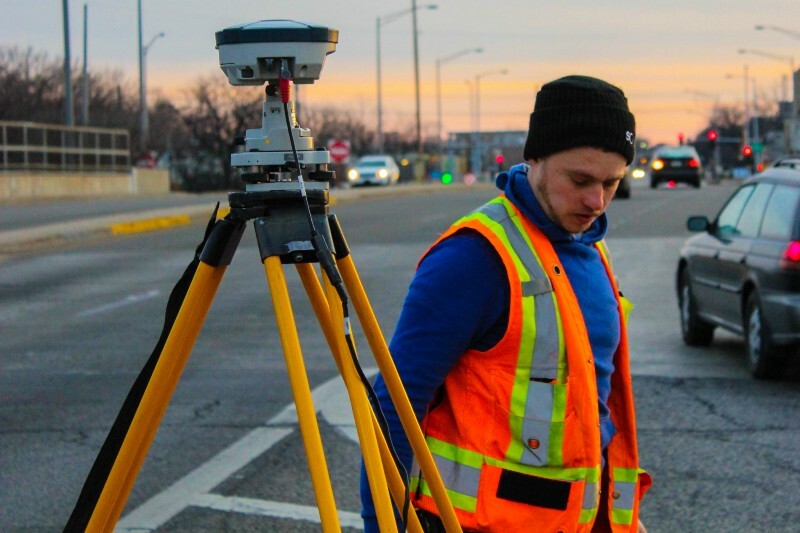 This innovative concept improved the aerial lidar dataset’s accuracy and provided our analysts the ability to deliver accurate topographic data both on the roadway and off of the hard surfaces to the right-of-way. 120 control points were required along the 5 mile collection route. High accuracy survey plus the stability of the point cloud resulted in an RMS for the point cloud of 0.007’ vertical accuracy — or as the title of this piece suggests ‘incredible accuracy.’ Continental Mapping lidar analysts then extracted a comprehensive dataset of features from the point cloud resulting in an RMS for the DTM of 0.03’ vertically. This project was a feather in the cap of Continental Mapping and its Project Management Office. The Project Management Office worked diligently with all involved parties to get the team in position to collect in what was a very tight window. After some existing lake-effect snow melted, a clear Friday morning came just in time, and the mobile lidar was collected with just hours to spare before a monsoon like rain storm hammered northern Indiana.